Recently, I moved from teaching 5th grade middle-school students in a self-contained classroom to teaching 6th grade middle-school students in an 80-minute English Language Arts block. What I miss most is watching my students sprawled across our large classroom carpet reading picture books displayed around our classroom. While I continue to display these works of arts in my new classroom, the experience is not the same. As a self-contained classroom teacher, there was a certain comfort in knowing I’d see my students for almost the entire day. I had time! Now, I’m consistently surprised by just how little time I have with my students. We still read picture books, but, I must admit, these readings are geared more for a particular purpose, rather than simply for the pleasure of reading them. November is national picture book month! I’m planning to seize this opportunity to reintroduce my middle-school students to the joys of reading picture books. While they may not be able to sprawl across a large carpet, I do have a cozy reading nook that several students can occupy. I’ve asked my students to bring in beach towels so we can create comfortable reading areas in other places in our classroom. I’m excited about taking advantage of this month by picking a picture book to read aloud each day and then inviting my students to select a book to read themselves or with a partner. We plan to keep track of the titles, authors/illustrators, and the number of books we read and to post this information proudly. 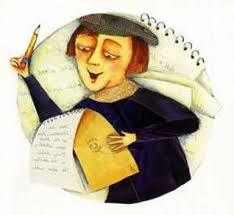 Stay tuned for updates about our readings and please share some of your favorites! 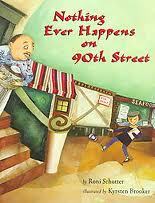 My first pick will be Nothing Ever Happens on 90th Street by Roni Schotter. It’s about a topic that many of my students can typically relate to: The challenge of generating topics to write about. For more information about National Picture Book Month visit: http://picturebookmonth.com/.